Prices start at £19,999 (+VAT) and are dependant on model, chassis age, mileage and box specification. With its unique styling and superior payload, the Supa-Lite 35 achieves its rugged durability through the use of advanced materials, skilled craftsmanship and excellent design, whilst remaining lightweight. It is truly the ultimate 3.5 tonne two horse horsebox. The Supa-Lite 35 body is constructed entirely of super strong but light honeycomb panelling and aluminium which eliminates rot issues (widely used GRP and plywood are prone to rot and can harbour bacteria). 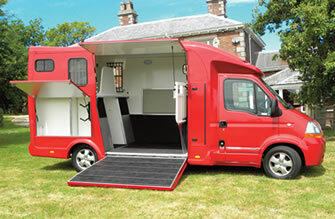 The roomy interior can easily accommodate horses up to and above 17hands. Special construction methods mean no visible fixings from the outside for a smoother superior finish. All windows are powder coated and tinted. Top quality paint with two coat lacquered finish. All Supa-Lite 35 Series boxes have either a 3 seat (35X) or 3/5 seat cab (35XS or 35XL), a light and roomy low-stress horse area and a day living. This is our latest model and is built with a 3 seat cab on a slightly shorter chassis than our other models.